The start of a new year has one looking forward to what the next twelve months' promises, and also back to the past. Living in the U.S.S.R. – in the conditions that were famed by its negativity – there were two things you could learn: to read between the lines and listen with the heart. And people were eager to know, there was always the feeling of lacking something and longing for the new. So, growing uneasy, for us it was nothing to compare with the first knowledge about the Western life. And since the mid seventies there was much more allowed to take a glimpse at. Everyone used to go to the foreign movies at the cinema and quite a lot of Italian or Hollywood classics were screened in these years. Also a number of good books representing English and American literature were translated, but there were almost no Western magazines available. So you couldn’t get the feeling and real life breathing of younger generations’ abroad otherwise than through the magic of contemporary music. It was the time of radio and imagination for a child in Soviet seventies. Listening to any good song from “other side”, hearing the voice - it was close to live appearance, this music spoke directly to your heart, vibrating some strange emotion of being together with the spirit of freedom. The sound was in your room and presence was so personal as some kind of communion. And it seemed only rock music had this charisma, instant impact and overwhelming influence. It was no matter lyrics could be very unclear due to the poor understanding of language. The latter made the phenomenon called 'rock' even more mysterious and attractive. It seemed this kind of music had no restrictions inside and also contained the unique voice and style of particular artist or band. But also all of them had the similar approach to social values tending to be free thinkers far away from any standards. And to most of us the music became so familiar as if you were born with these sounds. Although from the perspective of our everyday surroundings the artifacts of English or American rock music should look like meteorites: totally out of context in Soviet culture and the frame of mind. Though radios were all around and some good foreign stations were more or less accessible you couldn’t just sit without any effort and hear rock or soul music flowing. It was more like catching a tune, hunting for a song. 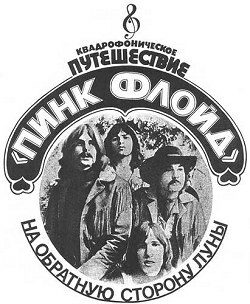 The most important foreign radio program in Russian language introducing pop and rock music to the U.S.S.R. was “Rock posevy” (Rock Crops) with legendary Seva Novgorodsev, since 1977 presented by the BBC Russian Service from London on short wave (the first special show dedicated to Pink Floyd went on air in July, 1979). In such circumstances, more likely the first your real encounter with rock would be through the sharing of recordings. It was your friend, sister, cousin or in some rare occasion, your parents who introduced you to their collected items. Except for classical music and some jazz virtually no Western vinyl records or cassettes were on sale and no rock music was released locally at the time. In spite of that fact, lots of original LPs received or brought from abroad were circulating, borrowed from friend to friend for recording, helping to develop reel-to-reel collections. Since the late seventies when cassette tape recorders became more available, individually reproduced cassette “albums” were spreading even wider. But none was made for sale, usually everyone was taping for personal use or admiration. Items were sometimes exchanged for re-recording, second or third time in a row, so of course quality loss was a norm. Leasing recording for a fee was considered by any music fan as an unpleasant act. If you were lucky enough you also listened to the original vinyl albums, lent by your friend or acquired at some wild price. The sum of money you would spend if buying a Western record in many cases were no less that the average month salary of the employee with the higher education. Or it took your entire piggybank from childhood to teenage years. And some of us spent it all. But even before you would start recording, almost surely the first unforgettable thing you hear would be The Beatles. The group that was already considered a pop classic even by the authorities. And then, if you follow your bliss in search of sound, if someone would talk you in excitement about the cosmic rock, as well as deepest human music - it all of course would be about Pink Floyd. Now you knew what to ask for the future birthday gift. And probably every teenager had a dream and struggle for “magnetofon” – as tape recorder was called in all wide Soviet Union. And then - your life changed forever. Hope one would excuse me for relying on personal experience and these reflections will help in any way to get the idea of atmosphere, common to many music fans or “melomans” as they were called here. In the seventies through all parts of Soviet Union this progressive group called Pink Floyd established itself, as the next most well know foreign band after the Beatles. For some time Pink Floyd were practically an equivalent of inventive rock group, consisting of four incredible individuals, well, almost five, because no one was forgotten. No home collection of recorded music was worthy without some albums by the Floyds. Having in mind how the number of original vinyl was relatively small, it’s almost anomaly how tape recordings were spreading wide and fast among the various nations of Soviet republics. Especially in the capitals and big cities. This developed in to the form of underground culture, which today looks obviously different from music piracy of any kind. There was really no other way to hear that music. And it went from people to people. In the light of this it’s interesting to note that the information about the same rock music and Pink Floyd in particular was not spreading well at all. Of course the media was run by state and the official press was vague in presenting any valuable readings about such admirable and bit dangerous act. Anyway some brief publications appeared but written with mistakes, such as “Mother with atomic heart” (for Atom Heart Mother of course) and in many cases the very name Pink Floyd was translated as Pink Flamingo! It was due to the enthusiasm of individual music critics the first serious articles saw the light of day in the end of the seventies. Artiom Troitsky, now considered the best rock music analyst in the history of Soviet Union, wrote one of the breakthrough introductions to Pink Floyd, the first titled “Quadrophonic journey of Pink Floyd to the Dark Side Of The Moon” published in some the small magazine in 1977. Next important article was almost an epic featuring the detailed history of the band as well as reviews of every record, told in witty style and deep understanding. The latter was published in the magazine “Muzikalnaiya Zizn” (Musical Life) in August 1980. And soon the same year the story was translated and published in main Lithuanian cultural weekly “Literatura ir Menas” (Literature and Art) this becoming the first source of exciting knowledge to many young music fans as well as mature intellectual readers. It also made Lithuanian youngsters love the literature newspaper because it was brave enough to publish cool texts about their favorite rock groups! In case to get such material published the author had to present to a certain degree the Pink Floyd as the artists criticizing the capitalistic society. Which wasn’t itself incorrect but was obviously stressed over the top. For instance, Animals album was introduced by Artiom Troitsky as a social "Chinese horoscope" combined with the moods of Animal Farm by George Orwell. It was supposed to picture typical bourgeois society “out there”, but the local readers, who were familiar with the music and lyrics, saw in Animals the representation of the Soviet “classes”. Pigs fitted well to party leaders and all kind of respected rulers of culture. Dogs clearly pointed to KGB agents and all sorts of careerists or guardians of the system. And of course, Sheep were all the rest - simple people like us. The influence and cult appreciation of The Wall on “this side” is simply immeasurable. As serious rumor goes, the only Soviet music mega label “Melodyia” was tempted about releasing the record in around year 1982. Some sources claim that the first copies were already printed in the factory. And suddenly in the West the new album of the group was out, The Final Cut. And it had the famous fatal line “Breznev took Afghanistan...” which probably challenged the urgent meeting of party leaders in Ministry Of Culture in Moscow. And all the printed issues were quickly destroyed under the factory press machine. Still, “Melodyia” does not confirm this story officially so it stays as one of the urban legends circulating to this day. But that is for sure, since 1983 Pink Floyd suddenly entered the high position in secret “black list” compiled by some party and komsomol headquarters. The list consisted of rock groups not to be played anywhere in open places and it was sent to schools and other educational institutions. It also meant no radio broadcasts, and television was of course out of the question. At the time, probably few ordinary people and only those who travelled abroad could claim in seeing the Pink Floyd on TV screen. No experience in seeing face to face obviously increased the attention to the photos of the band, images and sleeve art available to the fans. And there was always something visual about the music of Pink Floyd. This well known quality of their sound had the special turn to the listener in Soviet Union. Many of the music fans were lucky to see the cover of the vinyl album, while taping it, and some haven’t seen it at all. But if you once did, it will stay in the back of your mind. All the Pink Floyd album sleeves, especially done by Hipgnosis were taken as integral part of the record itself. It made an influence to local photographers, artists and was a theme for long exciting conversations. It became the style of seeing things, as “look, this could fit the cover for the next Pink Floyd album!”. The inspiration was huge and many of us started also to make 'replica' design for the cassettes we recorded. Those more skilled in art were recreating the cover sleeve to their notebooks or tape boxes and some works were excellent. Others were making photographs of the original cover, usually in black and white (most accessible at the time). Amateur posters and paintings started to appear. Needless to say, how much creativity was uncovered and elevated thanks to the amazing albums! It became almost a must to “save” the lyrics if we got such luck to find it all printed on the sleeve or inside envelope. There were no copy machines then (the first low quality ones became publicly available only in the end of the eighties). So all the song lyrics were re-written by hand to the notebook. And it was extremely important to have the lyrics of Pink Floyd because it’s not Abba which singing phrases one can instantly catch without effort. On the other hand, some of the memorable lyrics as from The Dark Side Of The Moon were quite simple and it brought a joy of understanding to the Soviet listener as probably to any non-native English guy. Since mid eighties suppression of rock music was heading to an end. Inside policy of U.S.S.R. went through rapid changes, "black list" of rock artists lost its power. In fact few important breakthroughs were already made since 1979, when Cliff Richard and Elton John played gigs at Moscow and Leningrad (now St.Petersburg). It was supposed to be the "evidence of democracy" for upcoming Summer Olympic games of 1980 in Moscow, but just few years afterwards rock phenomena made the serious shake of the cultural wall separating the Western side. Pink Floyd appreciation was blossoming in the mid 80's (in spite the new wave influence to music fashions). The knowledge about early history of the band became also more spread at that time, for instance in Ukraine there was an inoffensive gang who called themselves "Syd Boys" and greeted each other in the street like that - all because of their respect to the founder figure of the group. It could sound strange, but sixties Pink Floyd in means of information and recordings came to "this side" with much delay. All because the most well-know Pink Floyd albums that turned out to be most successful in the West made their way to Soviet Union first. And early records obviously were big rarity and harder to get. But every “old” album had the eager listener or "student" and such works as Ummagumma made a serious impact to the emerging Soviet experimental music scene. But the transformations of almost cosmic proportion were just round the corner. In November 1988, David Gilmour and Nick Mason were invited by "Glavkosmos SSSR" on the rocket launching site in Baikonur to witness Soviet-French rocket take-off in to space, with the Pink Floyd cassette recording on board besides the crew. The famous two guests were allowed to make the digital sound recording of the event, the unique rocket noise for possible use in the future album! And since this unexpected appearance, dazzling rumors began to turn about Pink Floyd wish to perform live in the Soviet Union. And even when the first messages about the tour appeared, many fans were still in disbelief. But like the dream come true, it happened, in June of the same year, as much publicized, five sell-out exciting shows were thundering in sport palace "Olympysky". And "Glavkosmos" - Soviet space enterprise was also one of the main organizers of the tour! Later that year, The Delicate Sound Of Thunder, double vinyl LP was released by "Melodyia" label, marking the first official recognition and was greeted by the queues at the music shops, still common at that time. Afterwards, more titles of Pink Floyd catalogue were issued on vinyl by semi legal label "Antrop" (offspring of "Melodyia") in early 90's. A sort of "Nice Pair" (with the cover of the Piper At The Gates Of Down) also was issued as vinyl double album by firm "Russian Disk" in 1992. Walls fell down and independent republics reborn in the place of Soviet Union, known of grand cosmic plans. And the group what once made the idea of "space rock" widely accessible, was also an important part of the universal changes behind the “iron curtain”. Pink Floyd belongs to the tape-to-tape revolution with irresistible bright will and they symbolically started live appearance in Soviet side at the Baikonur cosmodrome, heading us to the future with the better hopes. The first ever songs by Pink Floyd appeared in U.S.S.R. on flexi-disc as part of Soviet music magazine "Krugozor" (Outlook) in October 1980. Three tracks from The Dark Side Of The Moon were included together with the short introductory text. The sound quality of the flexi-discs were very low. Semi-legal issue produced (as stated on the cover) by the "Center of rock'n'roll congregations of united Evangelist-Lutheran churches of Russia"! Semi-legal issue produced by the "Center of rock'n'roll congregations of united Evangelist-Lutheran churches of Russia" in St. Petersburg. Note: To solve the legal problems, on all of the releases by "AnTrop" label the additional remark "Recorded from radio broadcast" was used on the record logo. (At the time, somehow it was legal by Soviet law to reproduce the radio broadcast on the record ).